Brooklyn Nets ownership has quietly been gauging interest among investors for months. That interest has picked up recently, and sources tell ESPN.com that Nets owner Mikhail Prokhorov has expressed to at least one interested party that he is willing to give up majority control for the right price. A source with knowledge of the financial situation says the asking price values the Nets franchise at $1.2 billion and Barclays Center, their home, at $1.1 billion. At that price, one source said, it's unlikely that a single buyer would be willing to purchase the team in its entirety -- especially given the losses that the Nets have shown. Sources confirmed that the Nets have had discussions recently with Guggenheim Partners. A source confirmed to ESPNNewYork.com that Prokhorov recently met with Guggenheim executive and Los Angeles Dodgers minority owner Todd Boehly in Russia. According to a report by NetsDaily.com, the two sides discussed a "combination of assets" with Prokhorov remaining in control of the Nets and Bruce Ratner maintaining control of Barclays. The seriousness of those talks remain unclear. But one thing that is clear is that any transaction between the two sides would not involve control of the Dodgers, who are owned by Guggenheim Baseball Management. Dodgers Chairman and Guggenheim CEO Mark Walter told ESPN.com: "I am the controlling owner of the Dodgers and I have no intention of selling the Dodgers or moving them into a new ownership group." Walter acknowledged that he had not seen the Nets financials but "they are a terrific franchise and I would be happy to look at their information and any proposal anyone wanted to make to me -- as I would with any proposal." After the Los Angeles Clippers were purchased by Steve Ballmer for $2 billion over the summer, Prokhorov gauged interest in the Nets franchise and was open to listening to potential buyers, despite the owner saying through a spokesman that he had no interest in selling the team. Prokhorov's tenure as owner has been defined by his incredible willingness to spend a fortune to win, but sources say the Russian hasn't been thrilled with the team's financial losses. The Nets lost $144 million in basketball-related business in 2013-14 -- $131 million more than the next highest team -- as reported by Grantland.com. It's been an eventful past few months for the Nets. First, there was the sudden and stunning departure of coach Jason Kidd to Milwaukee following the June draft after the first-time coach sought and was denied say over basketball decisions. That coincided with a shift in the team's previous title-or-bust approach. After surrendering three first-round picks to Boston a year ago in a blockbuster trade for Paul Pierce and Kevin Garnett, the Nets opted to let Pierce walk in free agency in July rather than make the forward an offer. Management felt the team was no closer to winning a title with Pierce, who signed with Washington for a two-year, $11 million contract that included a second-year player option. The Nets opted to acquire multiple second-round picks and sign younger players like Bojan Bogdanovic to develop and mesh with their veteran core. That thinking was in stark contrast to how the team operated last season when the Nets shattered an NBA record, paying out $90.57 million in luxury taxes alone. They ended up paying more than $197 million in salaries and luxury taxes in 2013-14. The Nets paid $12.88 million in luxury taxes in 2012-13 and nearly $95 million in luxury taxes and payroll. This season, Brooklyn could end up paying around $130 million in luxury taxes and payroll. The Nets replaced Kidd with Lionel Hollins, who was signed to a deal worth as much as $20 million if the team picks up his fourth-year option. The team also recently completed a buyout with assistant coach Lawrence Frank, who signed a six-year, $6 million contract prior to last season to help guide Kidd. Frank was demoted to writing daily reports by December after he and Kidd had a falling out. Prokhorov acquired majority ownership of the Nets in May 2010 for $223 million with the intent to move the team to Brooklyn and the $1 billion Barclays Center two years later. His current stake includes 80 percent of the team and 45 percent of the arena. At the time he purchased the Nets, he agreed to service 80 percent of the team's $220 million debt. While owners have been eager to test how much Ballmer's $2 billion price affected their own teams, one sports banking source told ESPN.com that some owners are suddenly delusional about the value of their teams. Ballmer paid 12 times earnings for the Clippers, while the next highest purchase multiple was the Bucks, bought earlier this year for five times earnings. Prokhorov had a knack for making headlines and stirring up things, especially when it came to the neighboring rival New York Knicks. The Russian billionaire declared his intention to turn Knicks fans into Nets fans and win a championship by 2015. 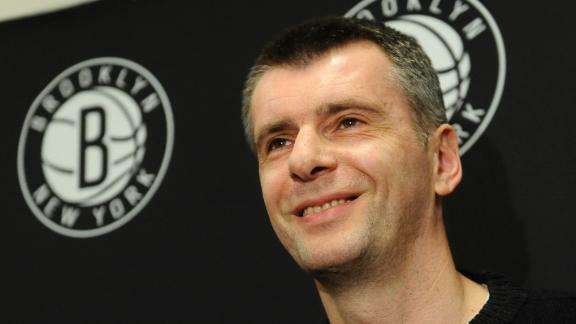 This season marks the fifth and final year of Prokhorov's five-year title plan. ESPN.com's Ramona Shelburne and Marc Stein, and ESPNNewYork.com's Mike Mazzeo contributed to this report.